This is my first time writing a full article, aside from a Cities analysis posted to the forums. After helping Cabd with previous articles, Lantharos and the Golduck/Floatzel teacher deck article, I decided to start writing my own. I write various things in my spare time, and playing the card game would naturally lead me to start writing for other players. Since new successful deck ideas don’t come easily, and there isn’t much to add to established analyses, there would have to be another way to get started as an article writer. I got permission from Cabd to work on his to-do lists of the teacher decks to keep the main page filled with new content while we wait for the Call of Legends release to bring us new decks to make and analyze. This article describes a simple way to block your opponent. A common way of disrupting your opponent, you can block Poké-Powers, Poké-Bodies, healing, good topdeck draws, Trainers, setting up, attacking, and even more. That’s too many to be covered here, as this article is supposed to be as short as I can possibly make it, so this will only focus on locking Poké-Powers. Anyone who read the Lantharos article might know how biased I am towards Ampharos PL, which will be expanded on again here because of its low price and helpful Poké-Body. Not only that, this card alone teaches Poké-Powers, Poké-Bodies, bench-sitters, and possibly ways to get Pokémon with a retreat cost higher than one out of the Active slot. There are three different types of Poké-Powers seen: ones that are used once per turn (such as Gengar Lv.X), ones that are used when the Pokémon comes into play (Uxie and Azelf), and as often as you like (Feraligatr’s Rain Dance). 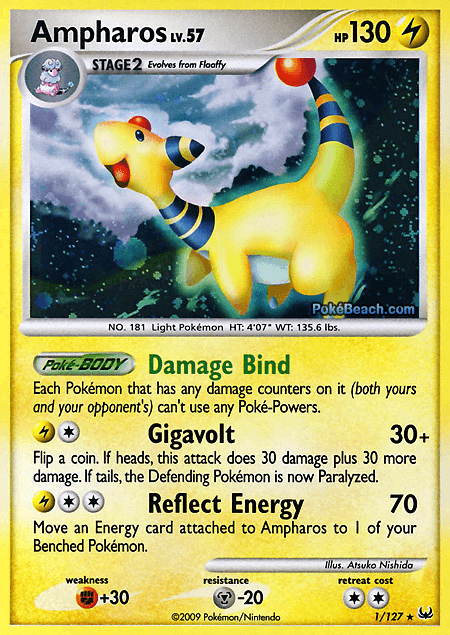 Most blocking techniques take out all three, though for cards like Ampharos PL, you need a combination of other cards to block anything but once-per-turn Poké-Powers. Described below, amongst others, are Pokémon that can block your opponent from using their Poké-Powers. Now that that’s out of the way, we can get to what I’m sure you came for; the actual deck list, and the strategy behind teaching and playing it. Since most cards for this use are expensive or too complicated for beginners, more focus will be put on cards that we can spare for children. This deck has more types in it than the straight water deck posted previously, and puts in more lines. Whereas the Floatzel and Golduck combo was a jack-of-all-trades tutor, focusing on wanting to hit hard and fast, this is more specialized, and above all wants to block your opponent from using their Poké-Powers to set up, or hurt you. Same disclaimer as any other teacher deck. This is not for meta game play, this is not to show your friends your awesome new deck to beat them, and this is not for someone who wants to test their new rouge deck. It is designed to lose, except against other decks that are designed to lose. The rare cards are all priced at below two dollars each, most being under one dollar, so if you don’t already have them, you can buy or trade them for cheap. Two Pokémon Collectors are found in the Trainer Kits, along with a few other staples, if you don’t have two extra and can’t find them anywhere else. And if you play at an official Pokémon League, free Expert Belts for playing cards for a few hours. While it’s fairly obvious on how to play this when you know it’s got a Power-locking focus, a new player will look at you and tell you how happy Ampharos looks. For the sake of a guideline for readers, and for the sake of making an actual article, here’s how to play. PokeBeachHopefully you start out with a Spoink in your hand, as you’ll want Grumpig to attack as soon as possible. If you don’t start with it, Mareep is good second choice. The Bronzor and Spiritomb aren’t bad, depending on your opponent’s deck, but they won’t get you far as starting Pokémon unless you can get them out. (This is what the Warp Points are for.) 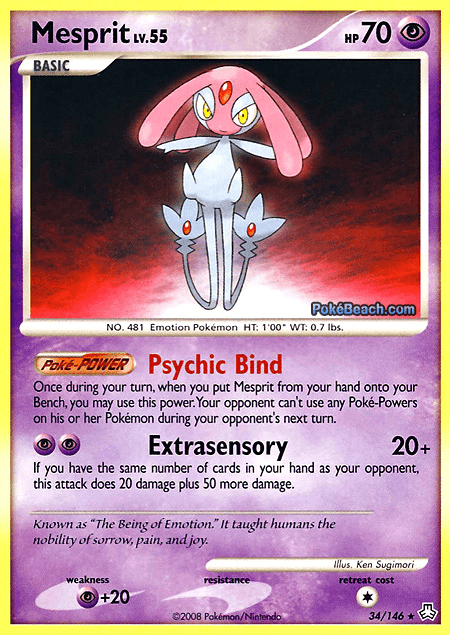 With Spoink, you want to attach a Psychic Energy on the first turn, if possible. Confuse your opponent and hope that the coin flip prevents them from attacking you next turn. If you can, put two Psychic Energies on it as soon as possible, but in an emergency a Lightning is fine, too. The point of having Spoink out is to evolve it into Grumpig on the second turn, if possible. You want your opponent’s Poké-Powers locked as fast as possible, for as long as possible. More on Grumpig soon. However, because it’s not guaranteed you’ll start like this, I’ll glance over starts with the other basics. If you get a possible Mareep start, but no Spoink, absolutely use it; it’s the second best starting basic you can get here. Attach one energy, but only one because you’ll want to retreat to the bench as soon as you can. Use its first attack, Minor Errand-Running, while you wait. It has a free energy cost, and lets you search your deck for a basic energy and put it into your hand. You have two main options from here. First is if you have a Grumpig ready on the bench, retreat it immediately to attack with Grumpig while you wait for an Ampharos. The second method is for a situation that it’s taking you a little longer to set up Grumpig, and you have enough energy cards from Minor Errand-Running. Make sure Mareep has at least one Lighting Energy on it, and evolve into Flaaffy and snipe all the Pokémon that you can. Like Mareep, it has a retreat cost of one, while Ampharos has two, so try not to evolve it before benching. The other possible starting Pokémon have fewer options, so they’ll be quicker to glance over. 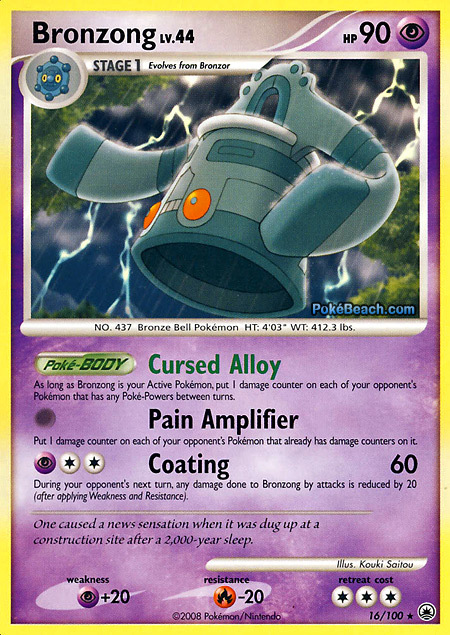 As a first note, the Bronzor can be replaced with any Bronzor, but this one was chosen due to the low retreat cost, colorless energy requirements, and Psychic resistance. If you start with this, have any energy on it to use Iron Defense and protect yourself when the coin lets you. PokeBeachFrom there, don’t evolve it unless you have a Warp Point in hand, or you can make use of its attack or Poké-Body. Bronzong will be talked about more later, so let’s move onto a non-AR Spiritomb start. While starting with it defeats its Poké-Power, you can’t always help but play it at the beginning. Like the others I like to use in this list, it has a retreat cost of one. Have one Psychic Energy on it (it will never need more than one Psychic) and attack. This attack works better on some decks more than others, but in the early game, just try to hit as many Pokémon as you can before retreating under the same conditions as Mareep or Flaaffy. The last option is the Old Amber, which you’ll start with in the worst possible case. There is no good reason to use this card as your starting active Pokémon. Unless you put some TM tools in this deck, Old Amber can’t attack, and it can’t retreat. The only plus side is if your opponent knocks it out, they don’t get a prize, but it’s still not something you want to happen, especially if you have no bench. My advice, search out the Aerodactyl and evolve it as soon as possible to keep it safe. Now that the starters are out of the way, let’s talk about Grumpig. You’ll be attacking with it through most of the game, so try to protect him. Note that Expert Belts are in this list; you will ideally be putting these onto Grumpig. The first attack, Psychic Lock, will carry you through the early game. Until you get Ampharos set up and the opposing bench sufficiently damaged, Grumpig is your only reliable way to block Poké-Powers. When you accomplish this, add another energy to it and use its second attack, Bench Manipulation. Chances are your opponent will have a large bench, and this is a case where the Expert Belt can come in handy. The higher your opponent’s bench count is, the higher the chance you have of doing more damage. Say your opponent has a full bench, chances are you’ll win the flip on at least two, and with the Expert Belt, that’s at least 100 damage for one attack. While it’s rare that you’ll want to, retreating this Pokémon isn’t as easy as Spoink, due to the doubled retreat cost. Either use Warp Point, or, if you have the extra energy, retreat it the standard way. 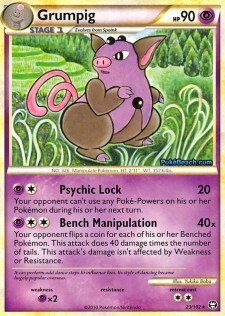 PokeBeachWhile Grumpig is a good enough attacker, you won’t get very far only using Psychic Lock to attack. If you managed the ideal start of an aggressive Spoink, then your opponent probably doesn’t have very many damaged benched Pokémon. Wait until you have a Benched Ampharos to do this, and then switch it out for your secondary attacker, either Spiritomb or Bronzong. If your opponent has a Poké-Power heavy deck, use the Bronzong, not only to damage them all between turns, but to attack for no energy. Just be careful of that high retreat cost. 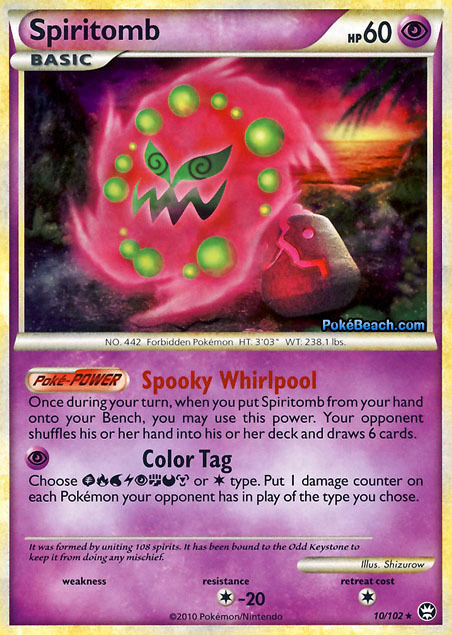 Your other choice, Spiritomb, is for if your opponent is playing a deck that has mostly the same type (e.g. Charizard and Blastoise/Feraligatr). To retreat Spiritomb, simply discard the energy it was using to attack and pull it back. 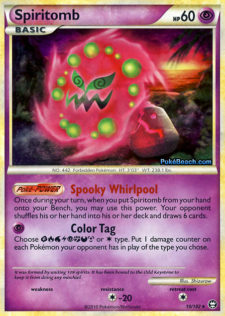 A note here on Spiritomb’s Poké-Power, Spooky Whirlpool. While it is a Poké-Power, it shouldn’t be blocked by Ampharos’s Damage Bind as it only works immediately when it comes into play. You may make your opponent shuffle their hand into their deck and draw six new cards. Emphasize to the child, “you may.” If your opponent has a large hand and/or has picked up cards they will want to play on their next turn, force them to shuffle it. If their hand is small or you know they’re in a drought (friendly chatter about techs and droughts is common in matches I’ve seen for everyone but the most over-confident players that ignore their opponents entirely), don’t let them draw more cards than they have. Just because you’re in a friendly conversation, you don’t have to give them an advantage over you, and almost everyone will understand that you want to win as much as they do. A Pokémon in this deck list that I haven’t mentioned so far is the Aerodactyl MD. While Ampharos blocks the once-per-turn Poké-Powers, you can’t deal heavy damage with Grumpig and block all of them at the same time. PokeBeachWhen a Pokémon comes into play, it has no damage on it, and is free to use its Poké-Powers. You can’t retreat Grumpig for Spiritomb or Bronzong every time your opponent plays a Pokémon, so keep Aerodactyl on the bench. 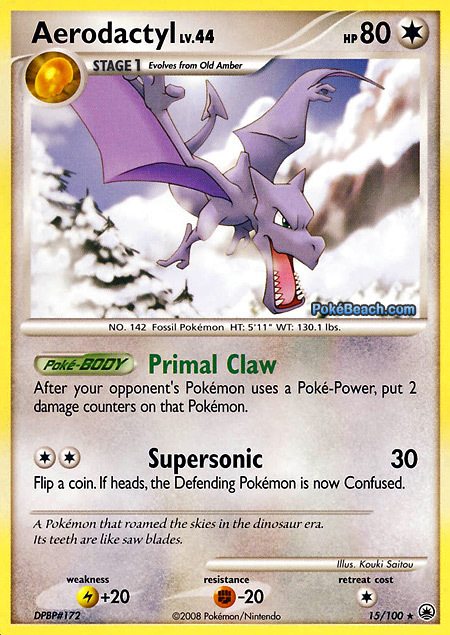 Whenever your opponent uses a Poké-Power, this activates its Poké-Body, Primal Claw, which says to place 20 damage counters on the Pokémon that used it. This means that you can cut down on your use of your secondary attackers and leave Grumpig up for longer. The best part is that it’s stackable, so if you can somehow get both out, that’s 40 damage to any Pokémon on your opponent’s side that uses a Poké-Power. I’m going to sound like a broken record here and tell you that, like the others, it has a retreat cost of one in case it’s forced forward. The only downsides are that it takes up bench space, and its pre-evolution. This section here will be dedicated to the unusual Basic Pokémon it evolves from, as its not in the “starting Pokémon” section. Aerodactyl, being “extinct,” must evolve from the fossil, Old Amber. You place it on the bench and evolve it like any other Pokémon. There are two Old Amber cards in format right now and the choice is all yours on which you should put in. The MD card has the Poké-Body, Hard Amber, which prevents all damage done to it while it’s on the bench. The AR version has the Poké-Body, Hard Amber, which prevents all damage done to it while it’s on the bench. If you have both versions, choose wisely which art you would rather look at, because that’s clearly the most important deciding factor in cards. While the Helix and Dome Fossils from the same sets and generation have the arguably-more-convenient Poké-Body of being able to evolve simply by attaching an energy of the right type, Old Amber is at least protected from sniping while on the bench. As a basic summary of the entire deck, bench Ampharos, bench as many Aerodactyl as you possibly can, and tank with a Belted Grumpig. Attack with Bronzong and/or Spiritomb sparingly, and your opponent’s set up will hopefully be stalled enough that Grumpig can sweep whatever they send up. PokeBeachThere are some Pokémon better suited to locking Poké-Powers than the ones I listed, yes, but remember that this is for new children. Once children get a grasp of this deck, feel free to add in a few better Pokémon if the child likes the idea of disrupting set up in this fashion. The best example of this adding in more Seeker and Super Scoop Up, along with a few Mesprit LA. 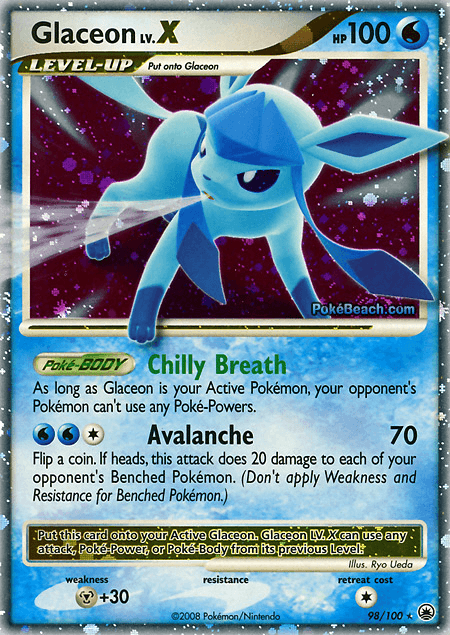 Another special mention is changing around the deck to make the main attacker a Glaceon Level X. Neither of these are in here due to price, rarity, and complexity. Another option when the child learns more about situational attacking would be Umbreon UD. While it may not block Poké-Powers, it discourages your opponent from playing Pokémon with them as long as you continuously wall with Moonlight Fang. Along with that, a special mention to Stadiums. While Stadiums on their own are basic, the two choices best suited for this deck are Miasma Valley and Galactic HQ. Both Stadiums have the chance at damaging your opponent before they can use Poké-Powers rather than hoping Aerodactyl or spreading does it for you. These aren’t in here because they also damage the learning player, and I recommend letting them adjust to basic play before making them hurt themselves to hurt the opponent. There aren’t as many decks for Poké-Power-locking as other archetypes. However, this only means it’s less expected when your opponent sets up Vilegar or Luxchomp, and you block everything using a deck they might not know. If the child tests multiple decks and they decide this is their favorite, have them test with proxies of the above, and direct them to where to get the cards needed. Remember, do not play this against a real competitive deck. It’s slow, clunky, weak, and not very good, but great to teach children different styles beyond the basics. Let me know in the comments how this was for a first independent article. Good, bad, needs more work, any of your thoughts on it. Next time, expect Cabd’s release of the next installment, “What a SPaz: Teaching Newer Players – Part 4”. “Old Amber counts as a Trainer card as well, but if Old Amber is Knocked Out, this counts as a Knocked Out Pokémon.” Something I immediately remembered when I got to that sentence of your article. There’s a couple of minor errors (like Old Amber giving up a Prize) but I don’t really care. These articles are so well thought out and nicely written and they have a really good purpose. They are my favourite thing on this site ever. Yeah, I don’t know what I was thinking with the Fossils, I know that ruling, and I’ve played with Aerodactyl MD before, so I know a prize is taken for Fossils. I have no explanation, I just slipped up somewhere along the line. Same with Warp Points. My best guess is when changing the deck list around to make it work, I removed all the Warp Points because I have an empty head. I’ll have to check any other articles I do for mistakes like this, thanks for pointing them out! That used to be the rule, back in the day. Around Mysterious Treasures, all the newly-printed Fossils (aside from Mysterious Fossil, which has not yet been reprinted) count as being Knocked Out. Before then, they could be used as walls that gave out no Prizes for being reduced to 0 HP. Huh, I actually wasn’t sure about the MT ruling. I only picked the game back up around HGSS, probably closest to UL’s release, after stopping at Neo Discovery. If reading Compendium questions about the change didn’t confuse me while writing this, I don’t know what did. Ah, and so it got posted. I’ll let Merrisa handle “tending to the comments” but I’d just like to thank everyone for their support of the teacher series. Also, a big thanks to Merrisa herself for offering to help me out with these. As you can see, she blows my little articles right out of the water. Pretty cool article. I am not sure how this deck will fare against decks that don’t use pokepowers. Heh, we’ve tested them against each other. This deck owns against Floatduck, but fails hard to “tanks for nothing” Any other match-up besides teacher decks is just silly.